The long and short views of equity in education: Steady progress or “whack-a-mole”? 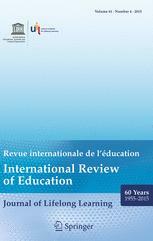 Koranic Education Centres: A viable educational alternative for the disadvantaged learner in Sahel Africa? Adult learning and social inequalities: Processes of equalisation or cumulative disadvantage?